HAGUPIT drifts south as it weakens into a tropical depression. 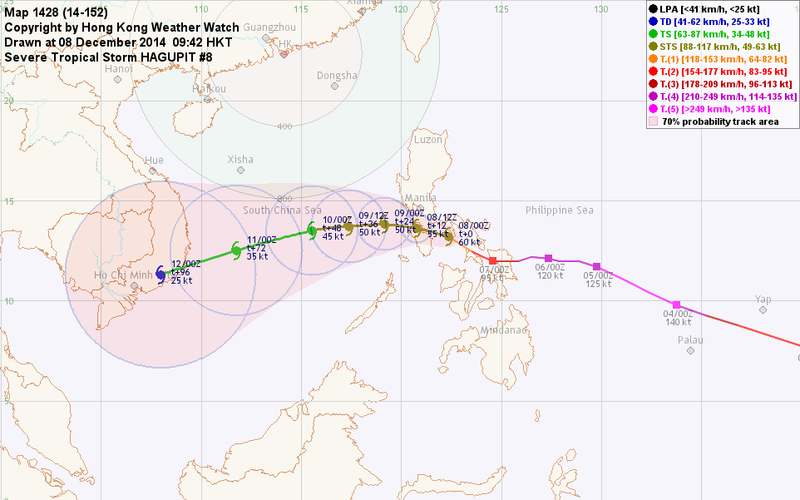 At 2 pm, HAGUPIT was centred about 330 km (180 NM) ESE of Ho Chi Minh City. HAGUPIT is the 66th name in the tropical cyclone name list. It was contributed by the Philippines, meaning to lash. This name was used in 2002 and 2008, both necessitating the #8 Gale or Storm Signal in Hong Kong. HAGUPIT will continue to move SSW or SW in the next 12 hours. HAGUPIT's low-level circulation is completely exposed and is drifting away from the main patch of convetions. In unfavourable conditions, it will weaken into an area of low pressure soon. This is the final bulletin on HAGUPIT. HAGUPIT has weakened into a tropical storm. 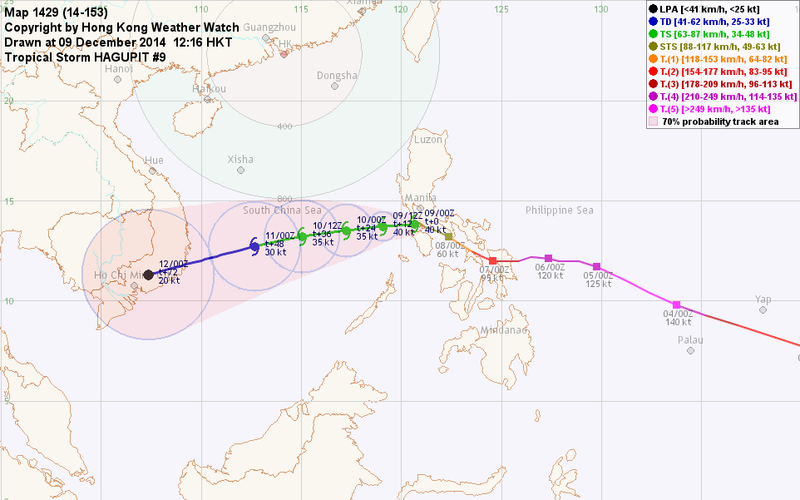 At 2 pm, HAGUPIT was centred about 680 km (370 NM) ENE of Ho Chi Minh City. HAGUPIT is expected to move WSW along the southeastern periphery of the subtropical ridge anchored in Indochina, in the general direction of southern Vietnam. HAGUPIT's convections weakened again, leaving its circulation centre partially exposed. In a relatively dry environment with low ocean heat content, HAGUPIT is expected to weaken slowly as it traverses South China Sea. Rapid weakening should occur after landfall at Vietnam. HAGUPIT is now travelling in South China Sea and has intensified slightly. At 2 pm, HAGUPIT was centred about 1080 km (580 NM) ENE of Ho Chi Minh City. The subtropical ridge has now established to the northwest of HAGUPIT. The storm is expected to accelerate to the west turning to WSW, moving towards Vietnam. HAGUPIT's core seems to have developed slightly in the past 12 hours. In a relatively dry environment with low ocean heat content, HAGUPIT is still expected to weaken slowly as it traverses South China Sea. Rapid weakening should occur after landfall at Vietnam. HAGUPIT is now exiting the Philippines, and has weakened into a tropical storm. 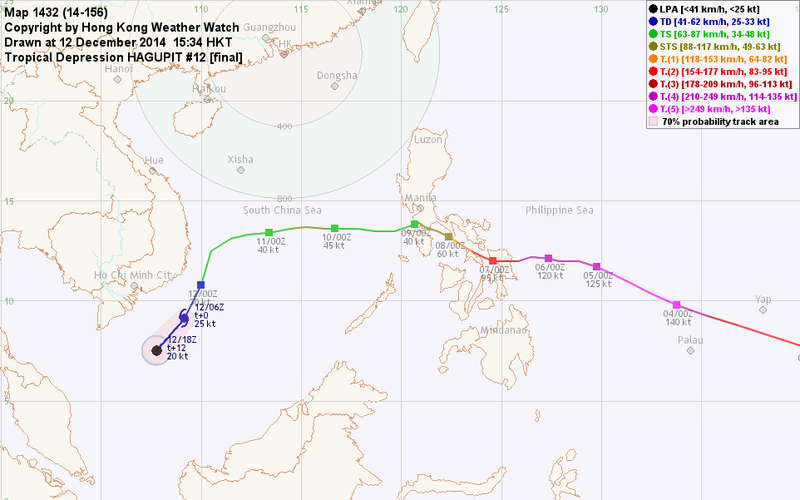 At 8 am, HAGUPIT was centred about 95 km (50 NM) SSW of Manila. As the western subtropical ridge strengthens, HAGUPIT is expected to accelerate to the west turning to WSW, moving towards Vietnam. HAGUPIT's structure is very disorganized due to prolonged disruption by the terrain of the Philippines. It is expected to maintain marginal tropical storm strength as it enters South China Sea, and continue to weaken as it encounters drier, cooler air. HAGUPIT weakens into a severe tropical storm as it passes through central Philippines. At 8 am, HAGUPIT was centred about 220 km (120 NM) SE of Manila. 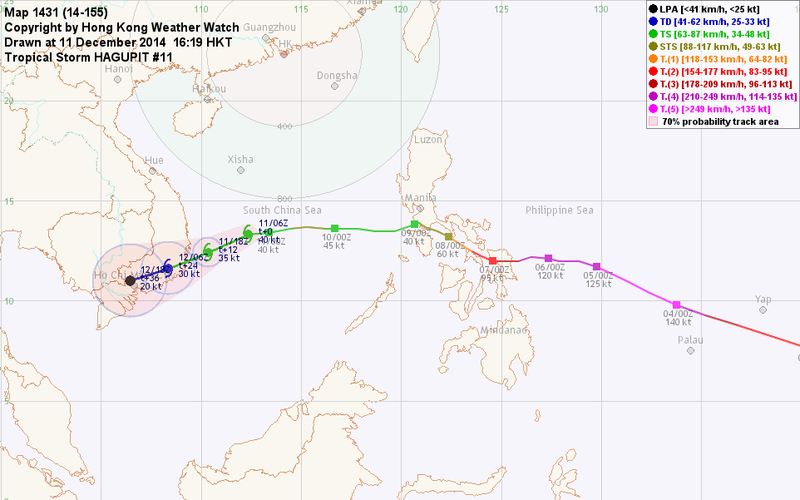 HAGUPIT will move WNW turning to W in the next 36 hours. Thereafter the western ridge should exert influence on HAGUPIT and guides it towards the WSW. HAGUPIT is losing deep convections quickly. The storm will continue to weaken while it crosses the Philippines, and also in South China Sea where atmospheric conditions are suboptimal. HAGUPIT has made landfall over Samar, and weakened into a category 2 typhoon. 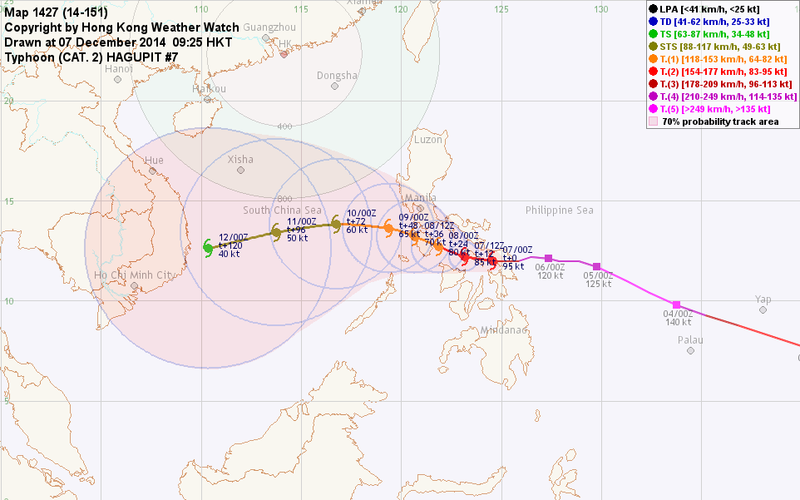 At 8 am, HAGUPIT was centred about 490 km (260 NM) SE of Manila. HAGUPIT is expected to move WNW along the southwestern periphery of the subtropical ridge as it tracks across the Philippines in the next 48 hours. As HAGUPIT enters South China Sea, the western ridge should take over and steer the storm towards the W to WSW. 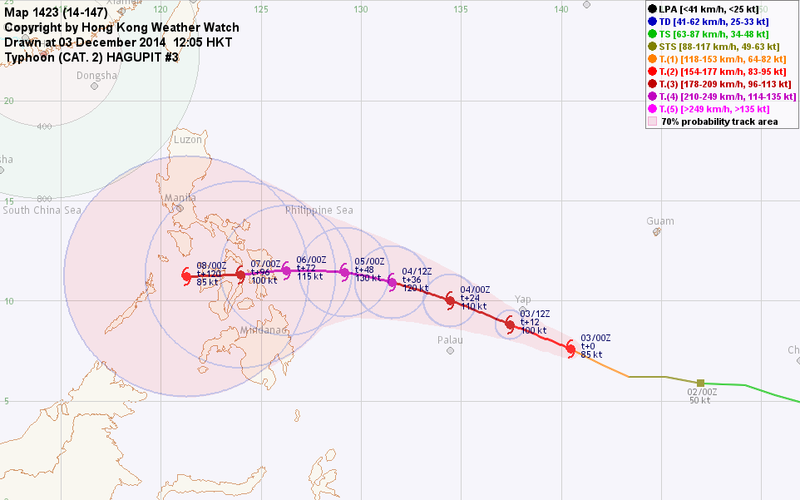 HAGUPIT's core is becoming looser and the storm is expected to weaken into a marginal typhoon in the next two days. The storm will be affected by suboptimal environment from the northeast monsoon when it moves across South China Sea, and will continue to weaken. HAGUPIT intensified briefly yesterday but weakened again overnight. 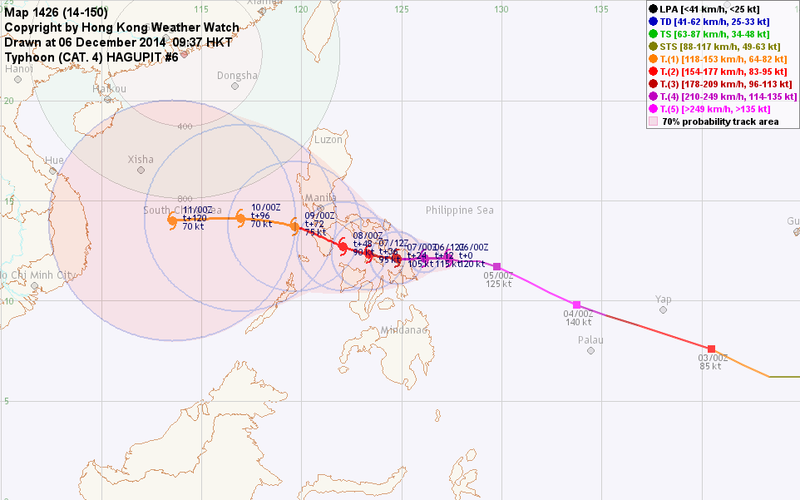 At 8 am, HAGUPIT was centred about 750 km (400 NM) ESE of Manila. HAGUPIT is situated within a pressure col and will continue to move slowly westward along a weak easterly stream. The subtropical ridge should build back near t+72, providing a slight poleward component to HAGUPIT's track before guiding the storm towards the west within the South China Sea. Land interaction may result in erratic movement as the cyclone crosses the Philippines. HAGUPIT's eye cleared briefly yesterday, but becomes cloud-filled again today. The storm will lose much strength as it spends long periods of time crossing the Philippines, and is expected to leave the country as a minimal typhoon. HAGUPIT weakened into category 4 as it moves into the Philippine Sea and decelerates. 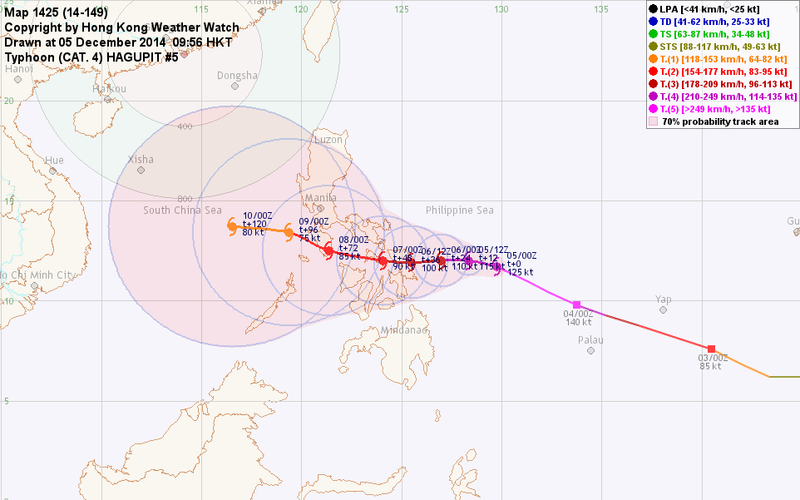 At 8 am, HAGUPIT was centred about 1010 km (540 NM) ESE of Manila. The subtropical ridge has weakened and HAGUPIT has decelerated significantly. HAGUPIT is expected to remain slow-moving towards the west in the next 72 hours, after which the ridge should build back and push the system into the South China Sea. Land interaction may result in erratic movement as the cyclone crosses the Philippines. HAGUPIT's eye became cloud-filled last night, and the central dense overcast has warmed. Increase in vertical wind shear and land interaction will cause HAGUPIT to weaken in the majority of the forecast period. HAGUPIT deepened into a category 5 super typhoon today. 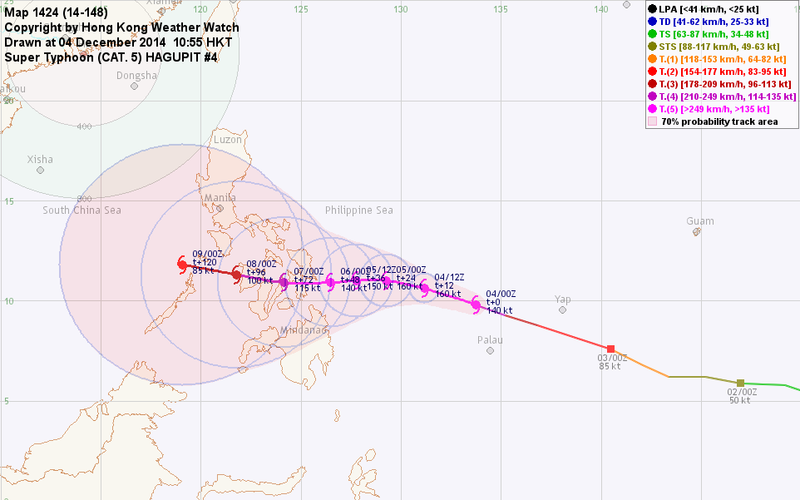 At 8 am, HAGUPIT was centred about 1490 km (810 NM) ESE of Manila. HAGUPIT will continue to move WNW along the southern periphery of the subtropical ridge in the next 24 hours. The ridge is forecast to weaken at that time, causing the storm to decelerate. HAGUPIT will remain slow-moving until the end of the forecast period, after which the ridge is expected to build back. The weakness of the ridge is not expected to be deep enough to induce a recurvature, but there is substantial uncertainty to this. HAGUPIT intensified rapidly over the past 24 hours as its central dense overcast deepened and a well-defined eye emerged. Further intensification is expected in the next 24 hours, after which the storm should weaken as it nears land and atmospheric conditions may not be as favourable. HAGUPIT continues to intensify and is now a category 2 typhoon. At 8 am, HAGUPIT was centred about 340 km (180 NM) SE of Yap. HAGUPIT is expected to travel WNW along the southern periphery of the subtropical ridge in the next 48 hours. The ridge is forecast to weaken at that time, causing the storm to decelerate. A surge of northeast monsoon may induce unfavourable environment that will result in HAGUPIT's weakening. As the storm weakens, it will be subject to lower level steering and move west or even WSW. There is substantial uncertainty to this solution due to the complex atmospheric conditions that are expected to emerge at that time. HAGUPIT is developing a central dense overcast. In warm seas with low vertical wind shear, the storm is expected to intensify within the next 48 hours. Conditions may deteriorate later on as shear heightens and as the storm nears the Philippines, which should contribute to some weakening. HAGUPIT has intensified into a severe tropical storm. 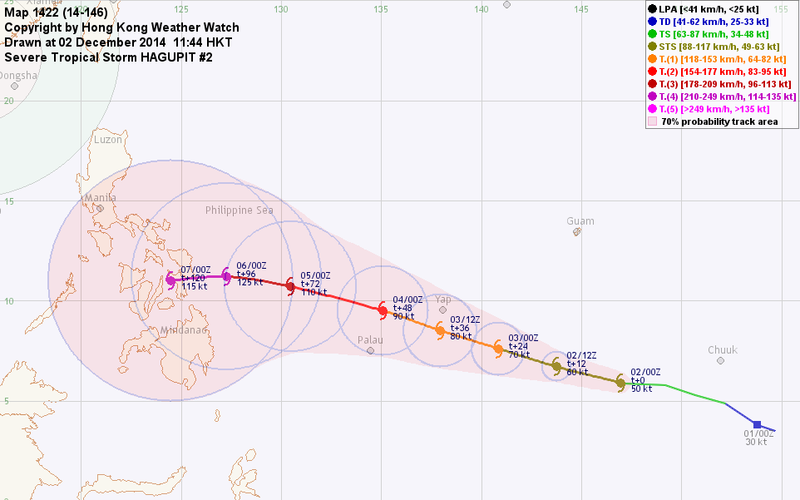 At 8 am, HAGUPIT was centred about 1060 km (570 NM) ESE of Yap. HAGUPIT is expected to travel WNW along the southern periphery of the subtropical ridge in the next 72 hours. The ridge is forecast to weaken at that time, causing the storm to decelerate. A surge of northeast monsoon may induce unfavourable environment that will result in HAGUPIT's weakening. As the storm weakens, it will be subject to lower level steering and move west or even WSW. There is substantial uncertainty to this solution due to the complex atmospheric conditions that are expected to emerge towards the later part of the forecast period. HAGUPIT has consolidated over the past 24 hours. In warm seas with low vertical wind shear, the storm is expected to intensify steadily within the next 72 to 96 hours. Conditions may deteriorate later on as shear heightens, which should contribute to some weakening. Tropical disturbance 95W over the western Pacific has gradually intensified into tropical storm 22W, and was named HAGUPIT. 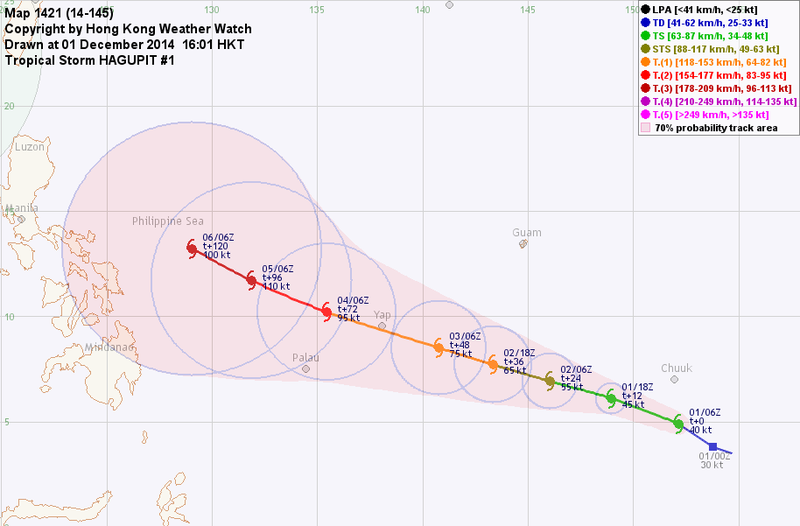 At 2 pm, HAGUPIT was centred about 230 km (130 NM) S of Chuuk. HAGUPIT is expected to travel WNW along the southern periphery of the subtropical ridge. The ridge is forecast to weaken by t+72, causing HAGUPIT to decelerate. HAGUPIT is developing quickly and its convections are already wrapping tightly around the centre. In warm seas with low vertical wind shear, HAGUPIT is expected to intensify steadily through t+72 to t+96. Conditions may deteriorate later on as drier air intrudes, which should contribute to some weakening.